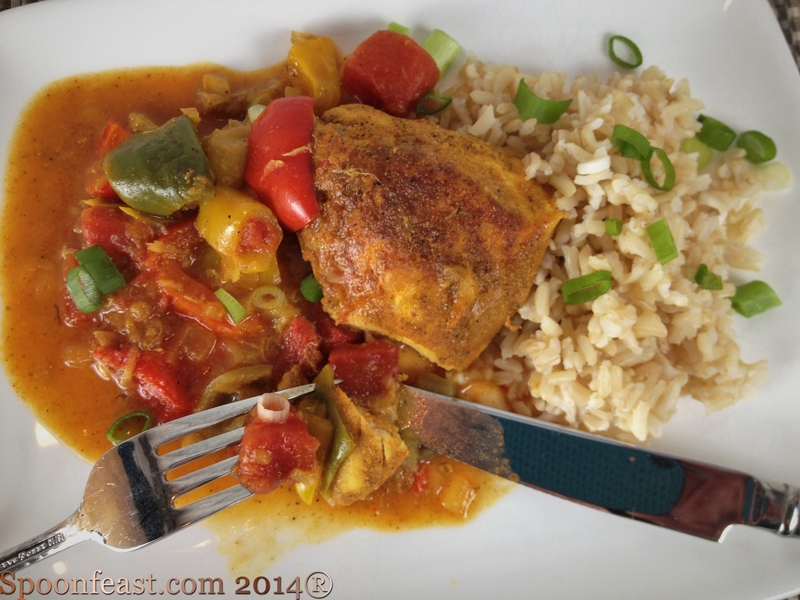 So here is a recipe for a hot and spicy chicken from Paul Prudhomme. He calls it “Frontier Chicken”; I call it delicious! 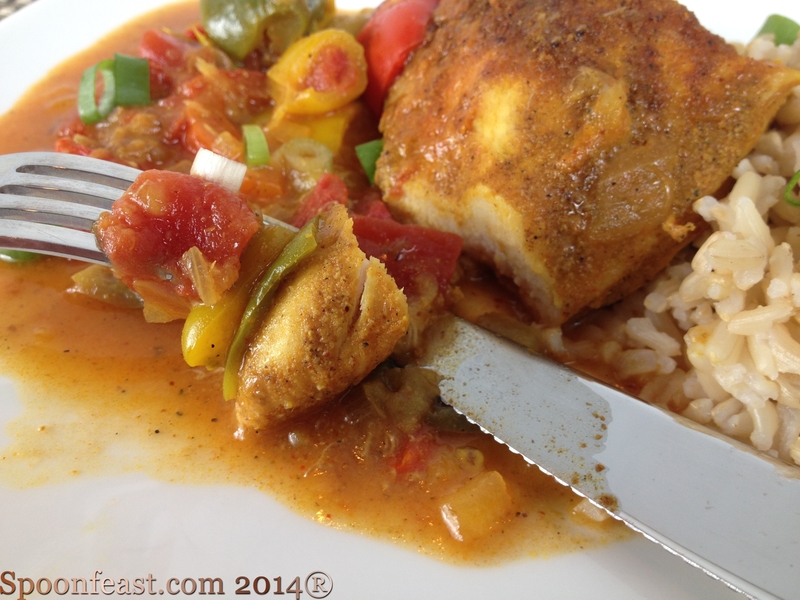 The flavor resembles Chicken Creole and will leave you smacking your lips because it is so good. I left out the jalapeno because I thought it had enough spicy heat, but if you can tolerate them, add them in. We served sliced jalapeno on the side. There’s one element that will surprise you. Banana! Don’t leave it out! It makes for such a delightful complex surprise when you’re eating and there’s that bite. 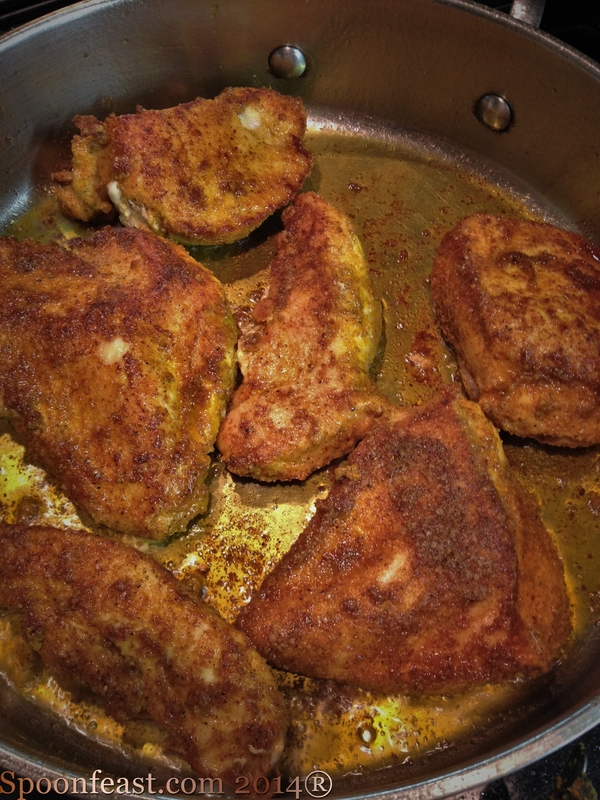 . .
Sprinkle each side of the chicken breasts with ½ teaspoon of the spice mixture. Be sure to massage it in well. Heat oil in a large skillet or 5-quart pot, add the chicken to brown each side, typically 2-3 minutes on each side; remove from pan. If you notice the chicken or the pan is starting to burn, turn the heat down. Once the chicken is removed from the skillet, place it in the oven to keep warm. It will finish cooking later. Add 1 cup of the onions, only half of each of the chopped peppers (not jalapeno) and the banana and the remaining seasoning mix to the pan. Cook; stirring occasionally and scraping the pan for about 10 minutes. IF anything starts to get too brown, add chicken stop to loosen everything from the bottom of the pan. Add garlic, ginger and flour, stir until the flour is absorbed; add the remaining peppers, onions, cilantro and jalapeño. Cook for 5 minutes, add the tomatoes and remaining stock. Bring to a boil. Add the chicken and any juices that may have accumulated to the pan, reduce to low and simmer about 10 minutes more until the chicken is cooked through. Serve hot over steamed brown rice; add a crisp, crunchy salad that includes cucumber to cool the mouth down! The heat is coming from several sources: cayenne, cumin, and ginger, dry mustard, chili powder, and jalapeno. Adjust any one of these to cool it down if it gets too hot for your taste. I just left out the jalapeno for us and served them on the side. This entry was posted in Cooking, Main Courses, Recipes and tagged Creole cooking, hot and spicy chicken, Louisana cooking, Paul Purdhomme. Bookmark the permalink. We had it again last night and it IS Spicy!